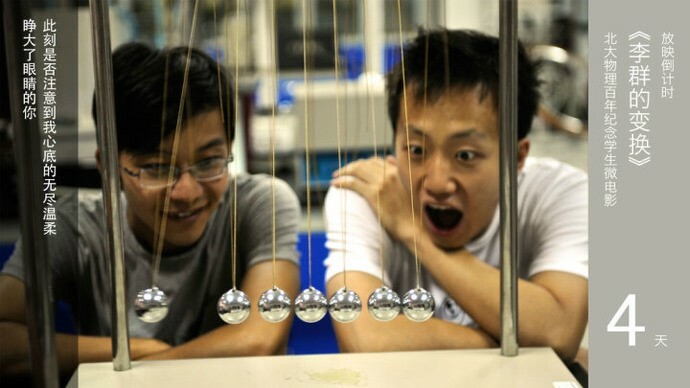 This is a film in order to commemorate the centenary of School of Physics, Peking University. The story is about the spiritual journey of a physics student Li Qun (Homophonic to Lie group in Chinese), about his life in his undergraduate life. Figure 1. The Stage photo of the film The Transformation of Li Qun. This film was released on October, 2013. Received strong reputation among the society. The film revoked many people’s memory of their undergraduate lives in school of physics, about their initial emotion of the beauty of nature, the joy of exploring the mysteries of the universe. The road of physics is tough and rugged, the people who choose to leave are worthy of respect, and the people continue on the road are equally worthy of admiration, because most of them are sticking to their dreams. Figure 2. The staffs of the film The Transformation of Li Qun.